This article will assume that parents are interested in learning when it comes to monitoring video game content for their kids. One would also assume parents are spending more time buying games and scrutinizing the content to ensure junior remains relatively innocent a little longer. However, recent polls reveal parents wilfully ignore game ratings when buying. This article is dedicated to equipping you, the interested parent, and not how to ward off blatant laziness. * 1. It is important to be involved in your child's gaming activity. 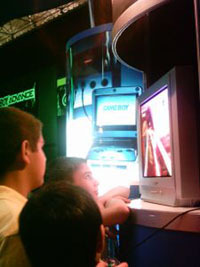 Watch them play, discuss the game once finished, and try to understand what components of the game your kid enjoys the most. This will help you understand the content of a particular game and will help underscore what your kid thinks is fun. Of course all kids have different levels of maturity, and parents should be sensitive to each individual. * 2. Before purchasing spend a few minutes reading online reviews. In a matter of 5 minutes you can find enough information that will not only give concise video game summaries, various ratings, but will enable you to read the opinions of various other reviewers as well. You can gather valuable information from varying opinions that will help you determine the content, playability, and cost. Let's face it, mind as well get all the bang for your video game buck because they're not cheap! * 3. When you reach the store be sure to spend time reading the labels, looking at the game art, and checking the ESRB rating. This is a step the majority of parents overlook or do not take seriously. By reading the labels you get a quick description of the game content, you will be surprised how useful these labels are. The independent video game reviewer body, the Entertainment Software Rating Board, place ratings on every video game box. Do not overlook this rating and the accompanying content descriptions because rest assured, the ESRB will not lie. Their descriptions are clear when describing potential violent situations that could occur during gameplay. Their ratings are self-explanatory and follow a similar system as movies. The rating symbols and recommended audiences are: "E" is for Everyone, "eC" denotes Early Childhood, "E10+" Everyone 10 and up, "T" marks Teens 13 and up, "M" Mature rating for ages 17 and up, "AO" is Adults Only, and finally “RP” means Rating Pending. Once again, you are the best judge regarding the maturity level of your kid, perhaps a rating of "T" for teen is too much for them to handle. * 4. Online gaming may change gaming descriptions. Many PC games, some Playstaiton 2, mobile games, and Xbox Live games have features that enable gamers to go online and play with other people, young and old. The box reviews may contain a warning, "online gameplay may change…" This means conversations between players, strategies, etc., are largely dictated by human players, many of whom are far older than your newbie kid. Be sure to watch online gameplay, however, a good rule of thumb is: if the game is already violent, it will remain so online. Sound easy? It is. * 5. Finally, review the game you just bought with your kid. Despite your work researching the actual game may differ from your pre-conceived notion. Not all sports games are as sporty and innocent as you may believe. Don’t be shy, sit down and pick up the controller, even if you're going to be beat by a 10 year old. All too often games are bought without any time spent reviewing the content, and then kids are left alone to play till their hearts content. These are but 5 suggestions that when implemented, will enable you to purchase appropriate video games with greater care. There is a heavy movement from the state to restrict video games via censorship, proof of age verifications, etc. Although some of these measures make sense, ultimately it is the responsibility of the parent to monitor the content of video games. So equip yourself. Take 5-10 minutes before your next purchase and do some quick research. And of course, don't hesitate to play the games you bought, if only to raise your kid's self-esteem by consistently losing due to your inept gaming self--but at least you did your job before hand. About the Author: Visit http://www.discussvideogames.com for online video game forums that includes all gaming systems. Visit the unique social issues forum dedicated to the topics of violent video games, censorship, and more.